A reporter, in 1958 the Associated Press sent the 27-year-old King to open a new bureau in a place where the news agency expected many stories to come from: Florida’s Cape Canaveral. King was intrigued enough with the infancy of the space program that in 1960, he went to work directly for NASA, as a public affairs officer. “Jack helped establish the original systems to ensure the news media received timely and accurate information about both the early human flight programs and the unmanned missions,” says Hugh Harris, the now-retired director of NASA Public Affairs at the Kennedy Space Center. King’s job got a lot busier starting May 5, 1961, when President John F. Kennedy set a goal to land humans on the moon by 1970. 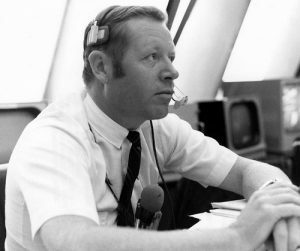 King served as manager of press operations for the Mercury, Gemini and Apollo programs, and one of his jobs was to be the “voice of launch control” for virtually every manned mission, starting with Gemini 4 and ending with Apollo 15. Which, of course, includes the mission just about everyone in the world with access to a TV or radio tuned in for. “Jack King counted down the launch of Apollo 11 and all of us watching on television will never forget his calm, reassuring demeanor,” says Bob Cabana, Kennedy Space Center’s current director, and a former astronaut himself. King “helped us understand in common English the complexities of space flight.” King moved to a position as a Public Affairs Officer for NASA headquarters, from 1971 to 1975, and then worked in private industry for a time, but returned to Cape Canaveral in 1997, where he worked as a spokesman for the United Space Alliance. He retired in 2010, but stayed on as a volunteer. King died from congestive heart failure on June 11, at 84.